There are certain wonders of nature that will fascinate every single human being on this planet. The colourful clouds dancing across the winter sky of the northern hemisphere are one of those wonders. The eyes of even the hardest-boiled beach goers and fans of tropical climates are lighting up when they hear about them. I hardly know anybody who doesn’t dream of seeing them: northern lights. 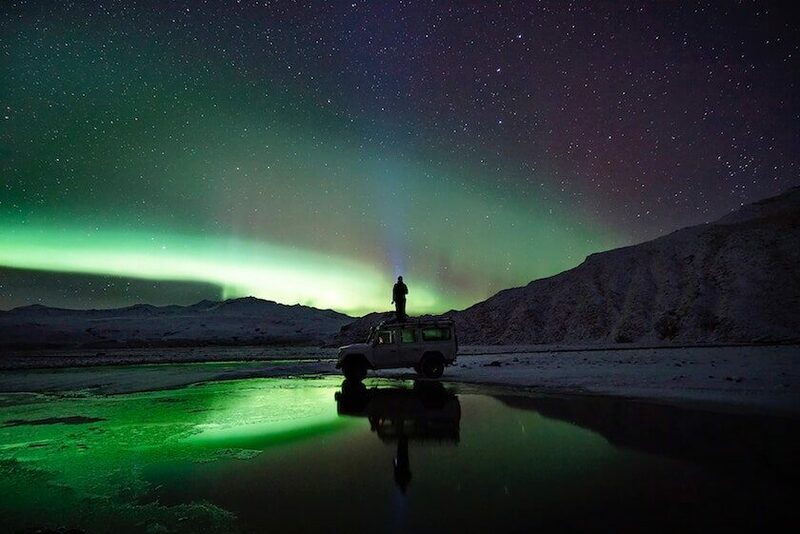 I have always been drawn north on my travels and so it happened that I have witnessed northern lights – or Aurora Borealis, how they are called scientifically – on more than one occasion. In 2010 I saw them several times when I spent a winter in Iceland, and in 2012 I was surprised by them on a late-summer hike in the Canadian Rockies. On all occasions the lights were quite weak, but I stood still in admiration, almost hypnosis, anyways. As winter is undeniably knocking on our doors and several of you have been enquiring about the perfect Northern Lights experience on our Facebook group, I wanted to share with you some of the things that I know about them. 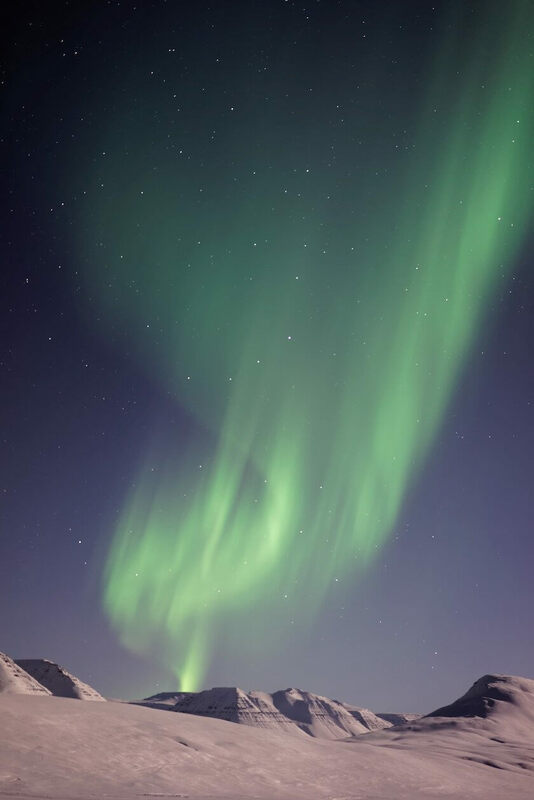 1) Where can you see Northern Lights? The name really says it all – you obviously have to go north in order to see the northern lights. While spending a winter in Italy is perfect to work on that bikini body on a pasta-pizza-belly, it won’t get you anywhere close to Northern Lights. You are better off travelling to Iceland, Northern Norway, Sweden & Finland, Siberia, Alaska, Canada or Greenland. There is no guarantee for sightings at any point, but your chances are particularly high above the Arctic circle. That said, all the northern lights I saw myself appeared much further south – in Reykjavik, Iceland and in Yoho National Park, BC-Canada. If you look at a map you will see that the latter is at about the same latitude as London – not necessarily a place where you would expect to see Northern Lights. They might have been weaker, but surely nonetheless beautiful and mesmerizing. There are regular appearances in the far north of Scotland and I have also just recently heard about sightings in Trondheim, Central Norway. 2) So, what are the best conditions for Northern Lights? There are many factors contributing to Northern Lights sightings; your geographic position is only one of them. Timing, light, weather/temperature and of course the Sun are just as important. Northern Lights can happen year-round, but in order for us to actually see them, it needs to be dark, dry and cold. That’s why you will probably be most successful in the winter months. During summer the sun hardly sets up north and it is way too bright for sightings. (Very) generally speaking, the best months are December through to March, as the days are short (hence dark) and it is much drier than in October or November. Most Northern Lights appear late at night (often after midnight). Cross your fingers for some freezing nights – low temperatures make for a clearer sky. Warmer winter days are usually wet and cloudy, while the few clear or even sunny days are ice-cold. Obviously you won’t see much of the sky if it is overcast. However, be careful not to mix up clouds and ‘diffuse’ auroras, which are more like a white glow and much less visible. This happened to me in Canada – if it wasn’t for my fellow campers, I would have missed the show as I thought all I can see is clouds. Minutes later they actually turned green and danced above my head. In addition to the seasonal darkness of winter, it is best to get away from any artificial light source as possible. Instead of standing next to a lantern by the town’s main shopping road, you should aim for a clear spot in a big park or even out in the wild. The less light, the better. Also, avoid full-moon nights for the obvious reason. Now this is where my knowledge gets a little perforated. I’m not a scientist, so I can’t explain exactly what is causing Northern Lights – but to be fair, not even scientists can agree on one definite cause. All I know is that it has something to do with solar winds that send clouds of magnetic solar particles our way – sometimes more, sometimes less, which is why you can’t see them everyday. When these particles hit the Earth’s atmosphere something complex and complicated magical and fascinating happens and we get to see beautiful lights in the sky. If that is not enough for you, check out this website which offers a way more advanced explanation. 3) What causes the different colours of Northern Lights? Which colour Northern Lights appear in depends on their altitude/distance to Earth, the wavelength of light emitted by the solar and atmospheric particles as they collide, and on the specific atmospheric gases. As our atmosphere mainly consists of nitrogen and oxygen, these gases influence the colours the most. Oxygen causes mainly green-yellowish hues, while nitrogen is responsible for blue/purple and deep-red shades. Find more information on the cause of colours in Northern Lights here. Most commonly Northern Lights will appear green – lucky you if you see them in red, pink or purple! Enough of the (scientific) background, and on to how to actually hunt them lights down. Like with any other natural wonder, the countries lucky enough to have them, incorporated Northern Lights into their tourism strategy. 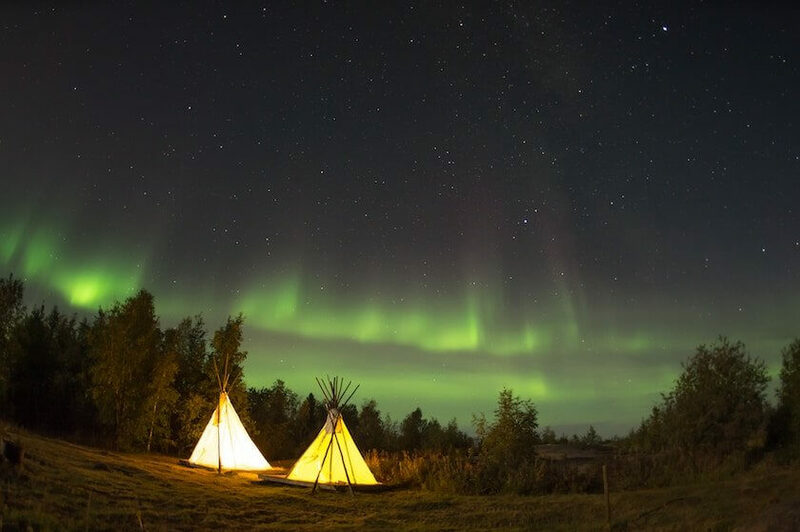 Everywhere from Finland to Alaska you will find tour operators taking you out on a night’s adventure with the mission to find some dancing lights in the dark sky. Due to the ideal conditions for sightings, those tours will usually be at night – meaning late at night -, take you to the out to the countryside. While a sighting can’t ever be guaranteed, these tours are a communal experience which makes them worthwhile – at least you spend your time with a group of excited people who are in awe for nature. There are too many operators for me to recommend any in particular, but make sure that you chose one that considers forecasts, takes you out into the dark wild, runs tours late at night and takes its time. It could take hours (of sitting in the cold) before you see the lights. Remember to dress accordingly – warm boots and clothes are bare necessities! As solar winds are not necessarily consistent, there might be weeks of complete absence of Northern Lights – checking forecasts is crucial to avoid disappointment. 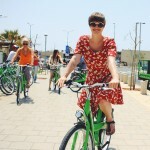 A good tour operator will not take you out on a bad day. If you want to head out on your own make sure to check the forecasts yourself to avoid disappointment. Again, nothing is ever guaranteed, but your chances are better if the forecast says so. Good websites to get precise, scientific forecasts are Geographic Institute in Alaska, Northern Lights Iceland, or Aurora Service Europe; Norway has even launched a mobile app for forecasts. Pack a flask with hot tea, bring plenty of warm clothes and maybe a good friend – it is time to wait and stare into the sky. Whenever I see the Northern Lights I feel like it is Christmas Eve and my birthday at the same time – I bounce up and down and want to hug the entire world. But I also want to snap cool shots of the lights to show off to my friends. If you want to do the same, you should equip yourself with a tripod and a camera which allows you to manually set aperture, shutter speed, ISO and focus. Launch your camera on a tripod – alternatively place it on the ground or some other sturdy surface. To ensure that the camera stays still you could either use the trigger delay of your camera or a remote trigger. Use a wide-angle lens and frame the sky with some point-of-reference in the front (a tree or the horizon). Turn off the flash and all automatic settings and switch to manual mode. Do the same with the focus and turn it to ‘infinity’. Set the aperture as low and the shutter speed as slow as possible – this way letting as much light into the lens as you can. My camera and lens allowed me to set an aperture of f4.0 (if yours goes lower, do so!) and a shutter speed of 30 seconds (if this blurs the lights, move back up to 12 seconds or so). Adjust the ISO setting, maybe around 400. Which settings result in ‘the perfect shot’ is pretty much trial and error – so give it a go. Once you press the shutter your image is only 30 seconds away – if you are anywhere as excited as me, this will feel like an eternity. The great thing about your camera is that it detects even the slightest source of light. This is why the lights on my Canada photos appeared consistently greener than they did in reality. 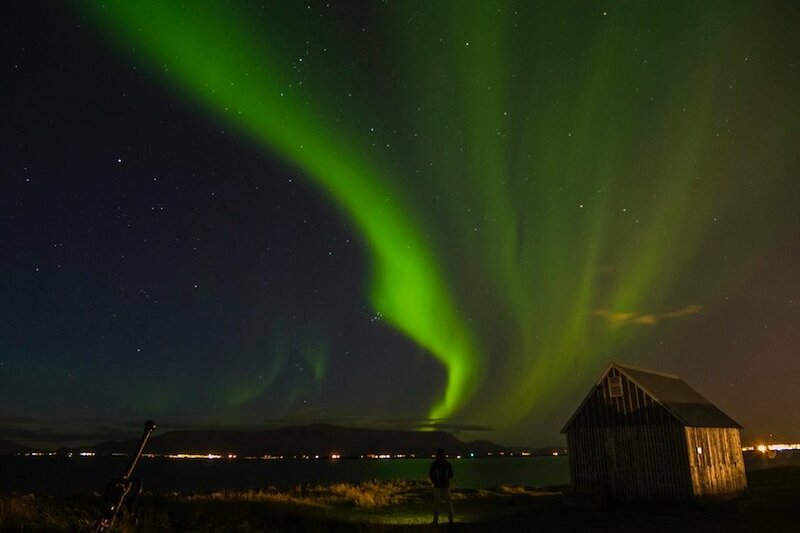 Have you seen the Northern Lights before – and did you follow a certain strategy? Or are you planning a trip up north this winter to finally find them? Hi, I'm guessing climate change is likely affecting the appearance and frequency of the northern lights? Anyway, my luck was to see them several times, when I was a child in the 1970s, in what was a small town about 45 miles north of Minneapolis, MN. They were light blue waves across the sky and in the summer as well. As you wrote, very mesmerizing. The occasion I saw them the brightest and most colorful was in the late 1980s outside Winnipeg, Canada in the middle of summer; weaves of neon green, yellow at the edges, and bright blue with bits of purple and pinkish violet. It was so amazing! It was around 2 in the morning. During my visit to Finland, i couldn't see them even though every condition was favorable. We are hoping we might catch a glimpse (if we're incredibly lucky) on our trip to Scotland as it's often sighted there too! It looks amazing. The big problem here in Scotland is the thing with the clear skies... I didn't get a chance to see them last year, but this year I'm planning a Shetland escape, maybe I'm luckier up north! Good luck with your search!!! So gorgeous! They are the next thing on my wish list! Thank you so much for the tips Kathi. I have always wanted to see the Northern lights and never have. Spending many summers camping in Northern Canada I wondered why I had never spotted them, but as you wrote, winter is more ideal. Thanks again! I went to Alaska a couple of years ago and spent a whole night with my sister waiting for them.., the conditions seemed perfect, but then it got super cloudy... we saw some very light green reflections in the clouds but I don't know if it was wishful thinking or we actually saw something! Anyway, I am planning to try again and again until I see them :p.
I am going to go to Iceland next week until the 10th of January, I hope be able to see the Northern Lights for the first time.